The Village Mercantile, Boonville; Scrappy Patches Quilt Shop, Brownstown; Quilters Corner Cottage, Charlestown; The Quilting Bee, Edwardsville; Let’s Sew, Evansville; Margie’s Country Store, Madison; L & L Yard Goods, Madison; Sharynn’s Quilt Box, North Vernon; & The Stitching Post, Washington. PLEASE BE AWARE THAT SHARYNN’S QUILT BOX HAS MOVED. 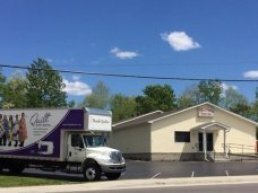 We are now located on SOUTH State Street. Please call if you need directions. Hours will be 9-6 each day Wednesday thru Saturday. Hoppers with Passports can purchase a block kit from each shop visited. BLOCK KIT FEE IS $5.00 EACH. Each shop has a unique way of putting their quilt together. So be sure to check each one. Finishing patterns and finishing kits will be available. You must visit all 9 shops to be eligible for these Grand Prizes! Row by Row “ON THE GO 2017” will begin June 21ST!! Our Row by Row is finished and we have posted a picture on our FaceBook page. Our Row is titled Bunnies on the Go and was designed by Janice Dyer Harrell. Hope that you will come and see it! We just love it! We are just 29 weeks away from Christmas! WOW!! We are receiving lots of Christmas Fabrics for those special projects. We have beautiful greens, reds, whites and patterns in candy canes, reindeer, holly, stripes, and white snowflakes! Come in to see all of them. We have Moda’s Sugar Plum, Henry Glass’ Reindeer Magic and Hoffman’s Cardinal Christmas, Brilliant Blenders and Winter Blossom. You will be inspired to begin right away. Rachel Remembered’s inspiration derives from an antique quilt that included a print commemorating General Andrew Jackson. Seeing that print mixed with the many beautiful floral and chintz prints was a reminder of his wife, Rachel who passed away after he was elected President of the United States but before he was inaugurated. Soft golds, federal blues, a deep shade of red and creamy background prints complete the feel of this vintage collection. Come in and see all the blocks that Cathy has finished. This is an absolutely beautiful quilt and we are sure that you will love it. The class is filling up fast and it looks as if we will have 2 classes! You can sign up at the shop or call 812-346-4731 to reserve a spot. Hoop size: 6x10 (embroidery field needed – 5.7 x 6.2 or a hoop in the appropriate size, cut-away stabilizer, 8x8 piece of batting, optional ribbon for loops and small black button for door knob. If you decide you want loops, yellow ribbon 2” in length is needed. White thread can be used throughout the project. If anyone has a Bernina, you will need to use the MEGA HOOP approximately 5.9x15.8. 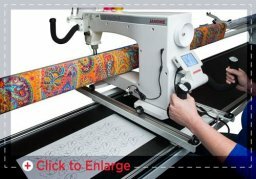 We have a new LongArm—Janome Quilt Maker Pro 18! This machine is now on display in our classroom. Come in and give it a test drive!! This machine is part of the Janome line of sewing machines and quilt machines. Sharynn’s Stitching Friends – June 10th 9 a.m. here at the shop. Embroidery Class – June 14th 9 a.m. and 1 p.m.